So you’re chilling with your friends in a coffee shop and there’s an awesome song been played in the background. Now you want to desperately download that song but after some time you forgot the lyrics but the tune is still stuck in your head. Well, this usually happens with all of us. So here are some audio recognition apps which will let you identify what song is this? 5 Best Apps to identify What Song is This? Shazam is one of the best app to identify songs with your smartphone. With shazam you can identify and get lyrics of songs playing in coffee shops, restaurant or bar. It’s very easy to use just hold your phone where the song is been played and hit the tag button. shazam will then start recognition what song is this. Once the song is been identified shazam will then link you to YouTube, iTunes, Spotify and amazon so that you could download or purchase the song. It’s available on almost all platforms like android, iOS, windows phone and blackberry. It’s also available for windows PC. 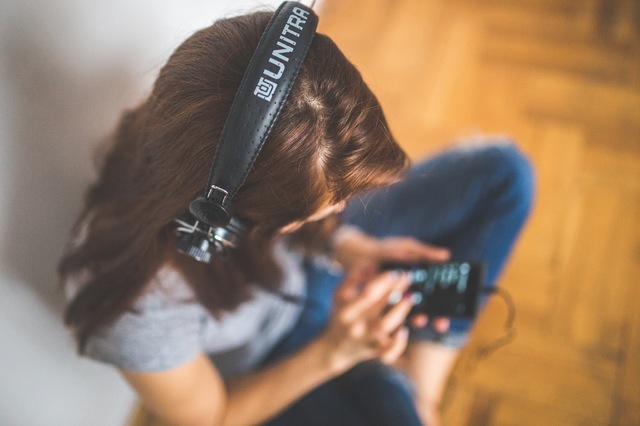 The free version allows us to identify up to 5 songs a month while the paid version which cost $4.99 helps to identify unlimited songs. It’s my default music player as it’s a combination of lyrics book and music player which displays lyrics while the song is been played. It has the largest lyrics database where you can find any song by just typing a part of the song’s lyrics. If you don’t remember the lyrics then you can point your phone at the audio source (Tv, Radio, Speakers) were the song is playing and it will magically identify the song. MusiXmatch can be a great replacement to your default music player. What if you have listened to a song at some place where you don’t have access to your phone. Also, you don’t remember the lyrics of that particular song. In such case, SoundHound is a life saver. It’s a great app which lets you identify songs by just singing or humming its tone. It also lets you identify songs playing nearby. Just tap the big orange button and point your device to the audio source to identify music. You can also search songs by typing the artist name, lyrics or simply by humming the tune. You can also view lyrics moving real time with the music in the LiveLyrics section. You can also receive social media updates of your favorite artists. TrackID is yet another app to identify songs playing around you. TrackID can identify what song is playing around you within few seconds. After identifying songs, you can either download it or watch it on YouTube. You can explore artist biography, see the top songs list and watch music videos. Unfortunately, it’s only available for Android devices. Music ID is as similar as all the above apps. The only difference is it lets you add notes or tags while recognizing music playing around you. This tag helps you to remember where you have heard the song. You can also make a search using artist name, song name or a certain part of lyrics. After identifying the song, it links you to 7digital or Amazon so that you can buy it. Here’s a tip for android users. 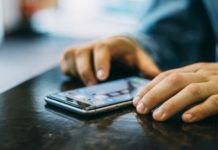 You don’t need to download any external app to identify what’s that song? 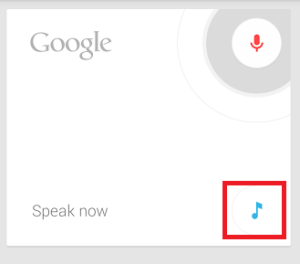 If you are in united states then you can do this easily identify songs using Google Now. Make sure you have the latest version of Google Search app. Tap the microphone button in the search box and a new music button will appear. Tap it and point your phone to the audio source (Where the song is being played). Now it will start identifying the song and will return the song name quickly. Best Websites to Identify What Song is this? One of the most annoying situation is when the songs tune is stuck in your head but you just can’t remember the lyrics. In case you just remember the tune of the song then Midomi can help you. Midomi is a type of music search engine where you can hum or sing a tune and it will return the song name instantly. So just grab your microphone and start humming the songs tune. Once the song is identified you can play the song to check it. When mobile apps fail to recognize what song is this, WatZatSong could help you. WatZatSong is a yahoo answer kind of website which allows you to upload a particular song tune and the members of WatZatSong will answer the song name. It’s helpful as there is no computer algorithm but real humans which are going process your query. WatZatSong is a great website to identify music but what if you didn’t receive any reply of its users or you want to instantly find the name of the song. In such case, you can use AudioTag in which you need to upload a small audio clip of the song. I tried singing and humming the song tune but it didn’t work. So you need to record the song when it’s playing. After uploading the song, solve the captcha service and it will start comparing your audio file to its database to identify what song is this. AudioTag is not so accurate but it’s still a good audio recognition website. Folk tune finder is a music search engines for folk tunes. Here you can discover new folk tunes and songs. You can simply make a search for the desired folk tune or you can enter the melody by hitting the piano keys. Once you find the tune you can play it and also get its ABC notation.